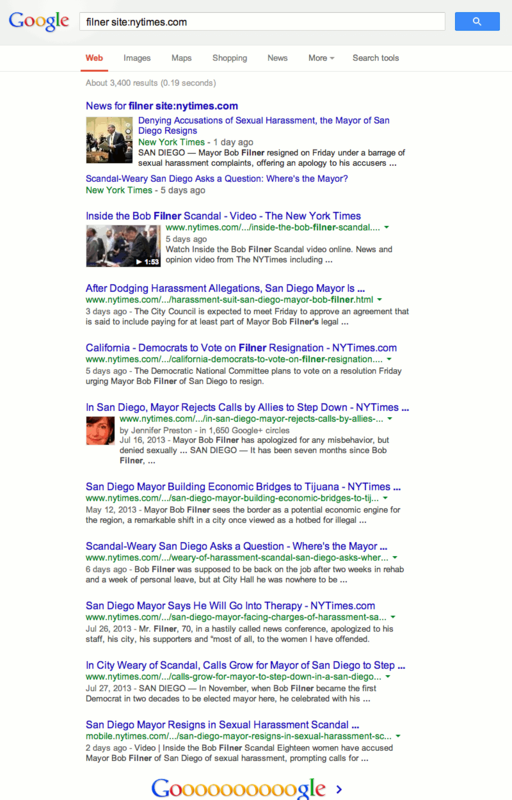 Meanwhile, the New York Times doesn’t mention Bob Filner in relation to any Saldana. Denying accusations, can’t scandal-weary San Diegans just get a break from this non-partisan mayor? It’s no wonder he thought he could get away with it. And it wasn’t just party that was left out of the news reports. Entire parts of the case were left out. 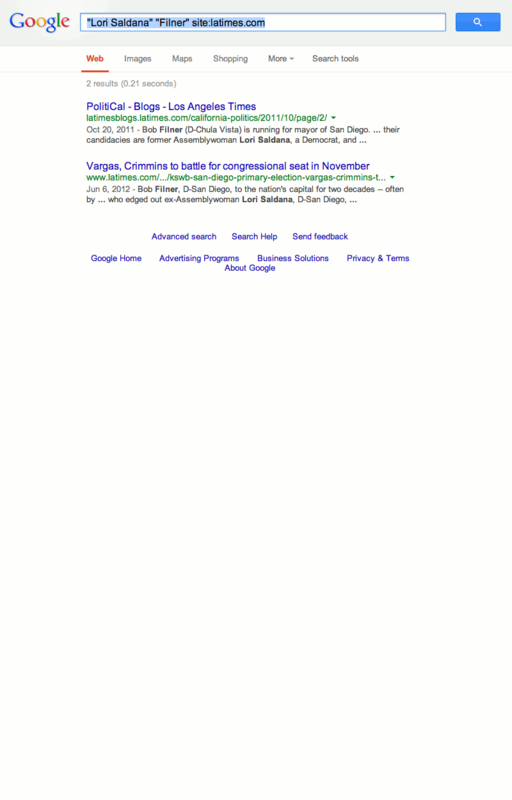 Lori Saldana’s accusation that she’d brought this to the attention of the Democratic Party before the 2012 elections and had then been threatened with loss of funding if she went public, were never reported in the national news. 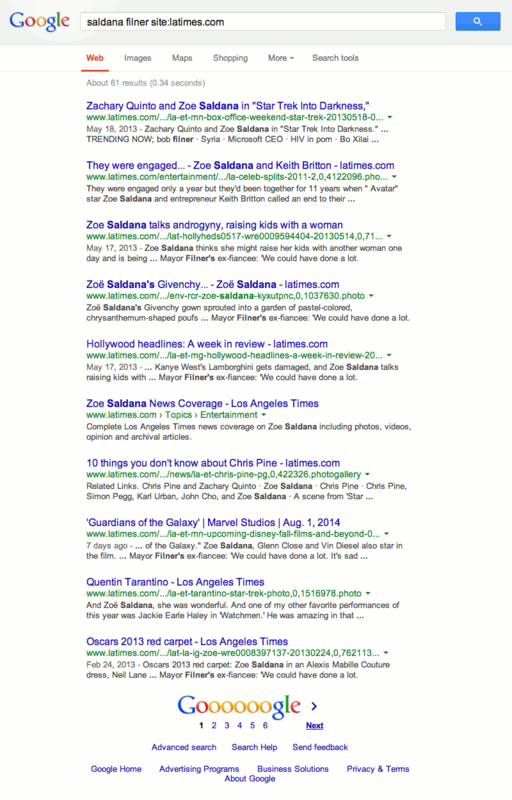 A Google search literally finds no mention of Lori Saldana and Bob Filner in 2013 on the Los Angeles Times, and no mention of Saldana and Filner at all on the New York Times. Because Saldana’s accusations would implicate Democrats as a whole, they were content to leave that as a local issue, as if this scandal was some big surprise to the Democrats and not an orchestrated attempt to bulldoze over these women’s complaints. Lies of omission are still lies. And in this case they were trying to perpetuate the lie that these were just allegations, not yet worth reporting on. This was a real war on women, perpetrated by Bob Filner and the Democrats, with their allies in the media. In response to Why isn’t Bob Filner resigning? : Because he thinks he can get away with it—and chances are, he’s right. The watchdog media becomes a lapdog media where Democrats are concerned, especially when those Democrats are in contested areas. Gosh, Mr. Filner. Are you a corrupt sleazebag? Why no, Mr. Chairman! Not enough for charges anyway! It’s getting crazier and crazier. The Democratic Party here knew about the accusations against Filner before he even ran. They covered it up. Their investigation consisted of… asking him about it. For examples of what Ace is talking about, consider “Judge dismisses Stevens’ conviction, orders probe” vs. “Spitzer May Yet Face Ethics Inquiry” from the Associated Press. The protagonist of the story in the first headline is the judge; the protagonist of the story in the second is Spitzer. Spitzer acts, Stevens is acted upon. 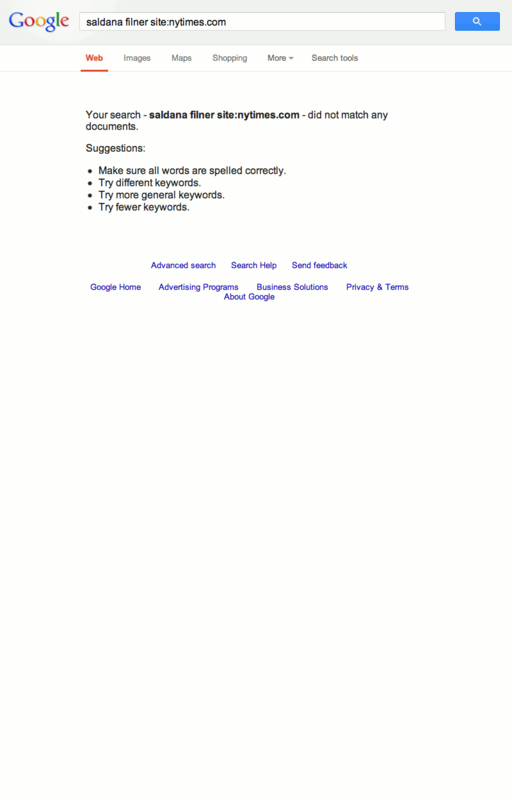 Bob Filner media post-mortem last modified August 25th, 2013.